This is absolutely stunning! Well done Janice, it's beautiful! Your mother will be delighted, I am sure! Just gorgeous...hope she loves it. What an elegant cake Janice, your mother will love it. And Happy Birthday to her, what a milestone! Beautiful cake and the flowers look so lovely. Hope you mum enjoyed it and Happy Birthday to her. 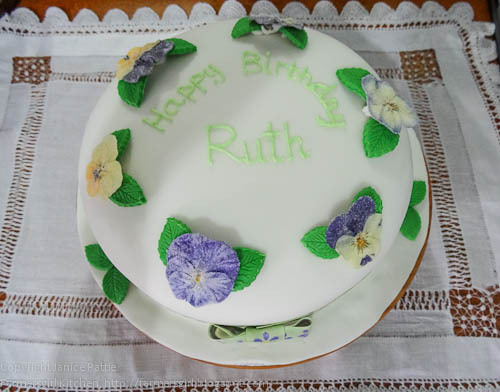 What a beautiful, beautiful cake Janice - you've decorated it so neatly and with a lovely design. 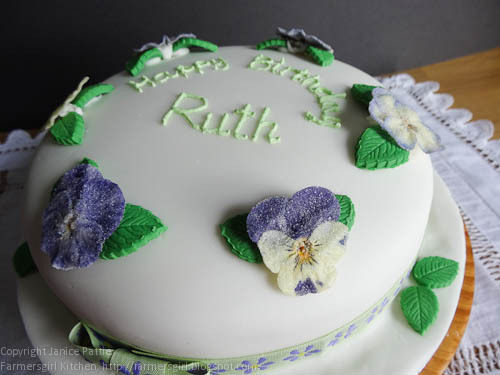 Those flowers are really pretty and I bet your mum will absolutely love the cake! 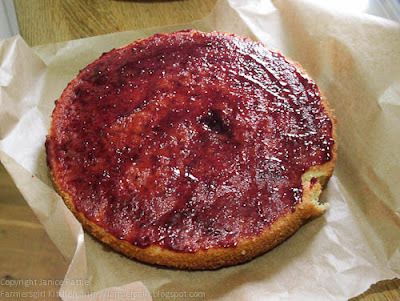 Janice, that is one very beautiful cake. You have gone to a lot of effort and it really shows. I love the hat look and as a big fan of edible flowers too I just love love love it. I've made crystallised pansies before and although I was rather pleased with the results, the ones you've used are decidedly more elegant. Oh you do have a lot to like up to, but you have definitely passed with flying colours. It is a thing of beauty! 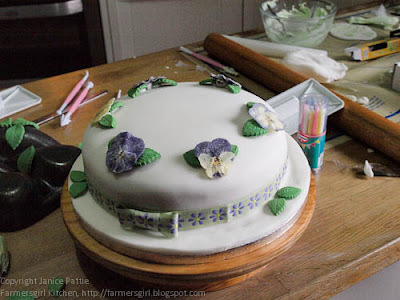 I love the idea of decorating cake with edible flowers. It's such a romantic idea and they always look so delicate. 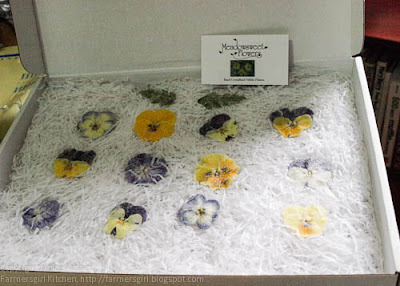 Pansies are one of my favorite flowers! What a wondrous birthday cake! I can only imagine what a delightful birthday your mom had! This is an awesome cake! 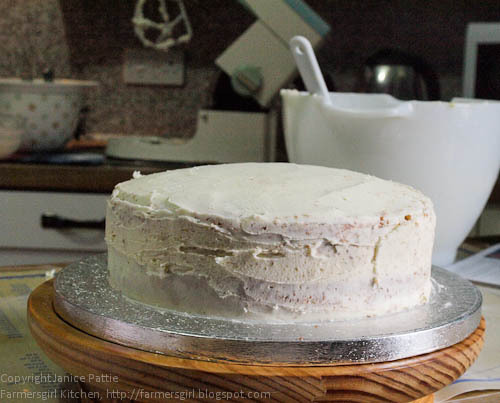 !Looks like baking runs in the family :) I'm sure your mum loved it - happy birthday to her! I'm not very good at covering cakes - yours looks perfect and I love the edible flowers! What a gorgeous cake, well done to you! Did your Mum like it? Happy Birthday to your Mum when her day arrives, my mum is 80 this year too! 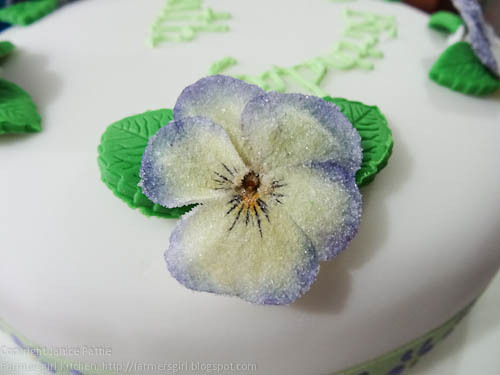 As you know I LOVE edible flowers and make my own, although I have to say those ones look FABULOUS! 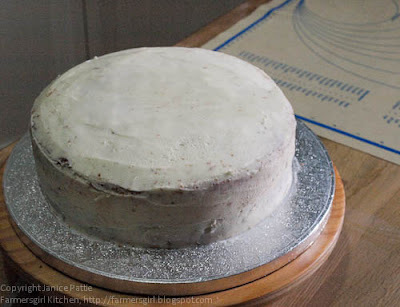 The cake looks wonderful and I am sure she will LOVE it! I am very proud to say that I have been featured in that magazine this month and have just received my complimentary copy! Fabulous cake and so very pretty too. I think Meadowsweet were at the BBCGFS in Birmingham. What a beautiful cake! It looks like something one would buy at a fancy bake shop. 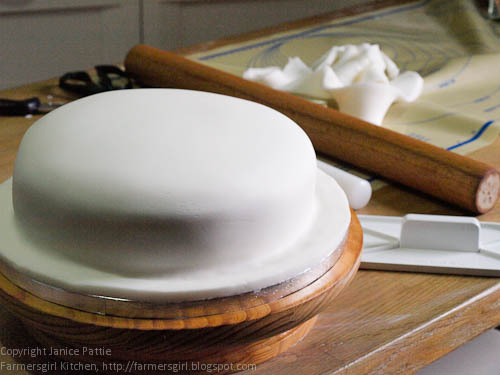 I am an absolute failure with fondant so I am doubly impressed on that count. I hope your mother had a fabulous birthday! The cake looks so delicate and pretty. None the worse for being frozen by the look of it. I hope your Mum had a fabulous birthday. 80 years old - WOW! Janice what a fantastic Idea of making such an mind blowing cake. I would love to make one and add some exotic arrangement of flowers for some special occasion in my life. Truly inspiring!! An absolutely beautiful cake and the flowers really do set it off. I'd be intrigued to see what other flowers you use in the future with baking.